Check out our “How To Register Video“ here. and assist with registration. All we would need is a few tables, chairs, and wi-fi. Simply email us to set up a date and time. all the information you’ll need to register each student. NOTE: This form is ONLY provided to assist your students with their class and title selections. Your account is where you manage all the classes registered for yourself, or for your students and/or children. You can log in repeatedly to edit titles, make changes or additions, delete classes, or simply print out your list of classes. ONCE YOUR TRANSACTIONS HAVE BEEN COMPLETED (Paid), you can still log in to your account to edit the titles of the pieces to be performed. Adding the title and composer is very important. What you type in the title/composer areas is exactly what prints in our Festival Programme. Our adjudicators are given an advance copy of their section of the programme so that they know which pieces you will be performing. PROGRAMME DEADLINE for titles: All titles must be finalized no later than two weeks after registration closes. Titles edited after that date will not be included in our programme and will not be supplied to the adjudicators. You can register yourself as a Teacher, Participant, Parent… or all of the above. You can now log into your account with your email address and password. If you forget your password, simply click the link on the ‘log-in’ screen. We’ve separated our classes into formal/RCM graded levels, and ‘open to everyone’ classes. You do not need to be studying at formal/graded levels, in order to enter our festival. Please visit our Download Syllabus page, or view or Online Syllabus for more details. “No Class Found” Download pdf . This means the information isn’t complete. The class will be highlighted in red, with a little red circle. Hover over the circle and it will tell you what information is missing. If you don’t know the title of your pieces yet, enter TBD in the title area so you can check out and complete your registration. You can edit the titles for two weeks after your registration is complete (paid). Most often, it’s because the class is missing a participant. Click the ‘add participant’ icon and your list of available participants will pop up. Our system is set up this way because many of our account holders register multiple students. When your class information is complete, the class will be highlighted in blue. 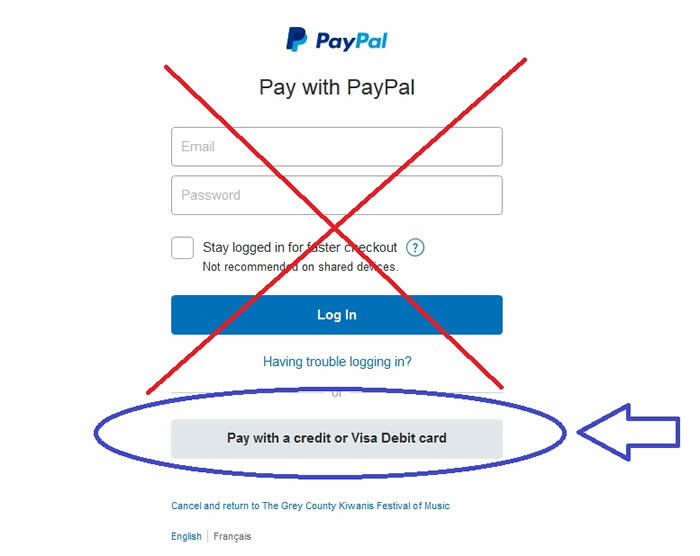 A PayPal account is not required for online payments. To by-pass the PayPal log-in, just hit the “Pay with a credit or Visa debit card” button.